By the 1910s, rampant high-rise development was overtaking much of Manhattan, advancing north up the spine of Broadway, beyond Union Square and Ladies Mile into the newly named Times Square at 42nd Street. On cross streets, especially in the 20s and 30s, speculators constructed block upon block of high-rises that leased space for offices, showrooms, and light manufacturing. The contemporary World Tower and the Bush Terminal Sales Building were extreme examples of tall and slender commercial properties erected by colorful entrepreneurs of the period. 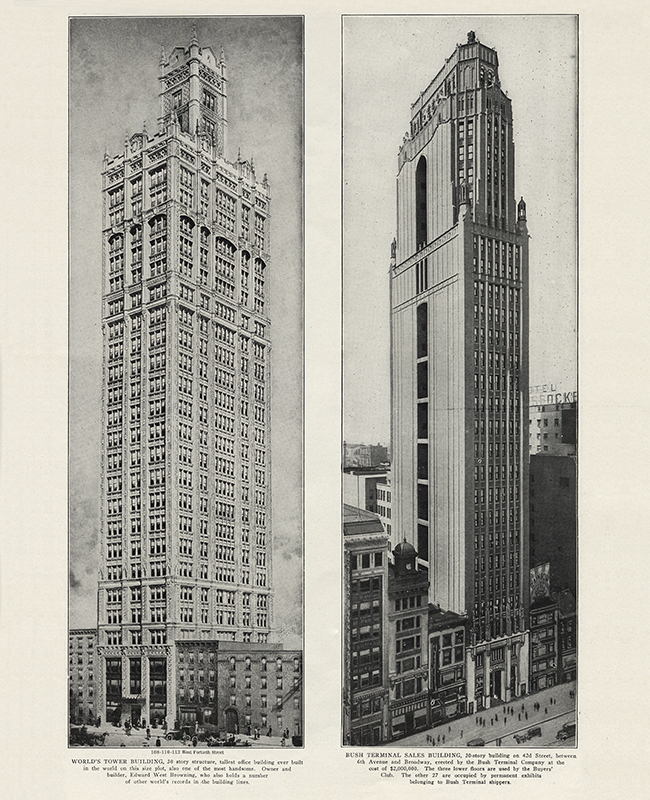 Both stacked thirty stories on lots less than 60 ft. wide, and the World Tower Building at 110 W. 40th St., completed in 1915, was trumpeted as "one of the highest buildings in the world on so small a plot of ground." The developer Edward West Browning indulged in rich white terra-cotta ornament, as well as the windows on all four sides of the World Tower, making it a standout among the more utilitarian lofts of the Garment District. Erected in 1917 by Irving T. Bush, the businessman who created the massive Bush Terminal warehouse and factory complex in Brooklyn, the Bush Terminal Sales Building at 130 W. 42nd St. was one of the last of the tall towers to rise without the setbacks the 1916 zoning law required. Its architect Harvey Wiley Corbett was a leading advocate of the setback form, but he was happy to oblige his client with a slender tower of stacked showroom floors that imitated a Gothic spire.